Bungling City of Winnipeg bureacrats are bleeding taxpayers dry and maybe someone has to kick Mayor Bowman in the shins under the table to get him to finally pay attention. Marty Gold takes 10 minutes to recap 3 recent examples of waste he's covered in previous podcasts - PEGGO, bike lanes, and the 311 service - and lo and behold, it's worse than anyone thought. Even when it's causing danger to taxpayers and city employees, your dollars are STILL being blown. - a no right-on-red bike lane resulting in Public Works to design a "dangerous" (their word) traffic bottleneck on Hargrave at McDermot; this was only admitted to the public after changing lane direction signage every 2 weeks didn't solve the problem; One councillor described it as "just a gong show". 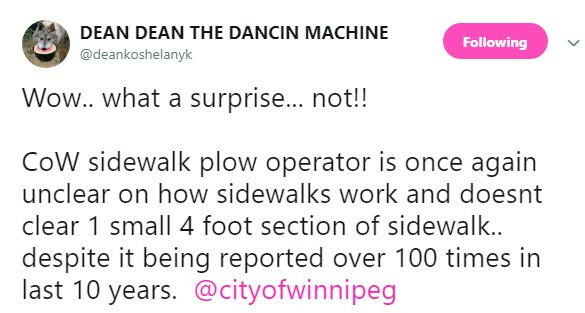 - an inability to schedule a snowplow to handle a key piece of sidewalk near a bus stop in Garden Grove; former school trustee Dean Koshylanyk told Mayor Bowman and all City Councillors about it in December 2016 (!) and explained how it could be fixed FOR FREE. To this day the City cannot get it plowed on time despite the estimated cost of looking into all the 311 complaints being - 2 years ago - $100,000. Marty calls for new councilors especially, to reject the status quo and ensure the civic administration faces consequences for blowing tax dollars and creating danger for drivers, pedestrians and bus drivers. Maybe the difference between 'quit or be fired' is a "nuance" - but in the real world (i.e. the private sector), this would be greeted with a desk or two being cleaned out.